Chronic obstructive pulmonary disease, or COPD is a progressive disease that make it difficult to breath. Over time the COPD progressively worsens . COPD can cause couching that produces a significant amount of mucus, shortness of breath. wheeziness, tightness within the chest. These people may have to clear there throat every morning and may have a chronic cough that produces sputum that may be clear, white, yellow or green. Severe COPD -Further worsening of airflow; greater shortness of breath, reduced quality of life, significant sputum production. Very Severe COPD- Significant reduction in airflow; chronic respiratory failure; greatly reduced quality of life. COPD is often cause by smoking. COPD Most people who develop COPD smoke or have previously smoked. Lung term exposure to lung irritants, such as smoke, dust particles, chemical fumes, or air pollution can also contribute to developing COPD. It’s important to know how the lungs work in order to understand COPD. The lungs are the body’s organs that allow you to breath. The lungs are inside the chest and help process oxygen. The Lungs help remove carbon dioxide ( waste product, that is toxic) from the body. The Lungs intake oxygen and remove carbon in what is called the gas exchange. Breathing is vital for life. The air that you breath in goes down your windpipe to your bronchial tubes or the airways. The lungs hold the ends of the bronchioles (BRONG-ke-ols).tubes, which are smaller, thinner tubes that branch out in bunches of air sacs called alveloi (al-VEE-uhl-eye). Small blood vessels, called capillaries run throughout the was of the air sacs or alveloi. When the air reaches the alveoli oxygen is passed through the air sac wall into the blood by the capillaries arteries. During this process the capillaries are also moving carbon dioxide from the blood, in the gas exchange. The airways are elastic and stretchy, you can breathe in air and the air sacs fill like balloons. The air sacs deflate when you breath out. The airways become thick and inflamed limiting the flow of air. The airways make more mucus then usual and clog air flow. In the USA COPD can include bronchitis and emphysema(em-fih-SE-ma). In chronic bronchitis (bron-KI-tis), the lining of the airway path is constantly being inflamed due to irritants, this cause the wall lining to become thicker and there is a lot of mucus that forms in the airways, making it difficult to breath. In emphysema, the walls air damaged preventing the air sacs from working, the air sacs then lose there shape and become unstable and floopy. The damae will cause fewer air sacs as the become larger, fewer ones instead of many smaller ones. This will reduce the amount of oxygen and carbon dixode that can be exchanged. Currently COPD is a major disability, and the third leading cause of death in the U.S , millions are diagnosed with COPD and may more have the disease but don;t know it. 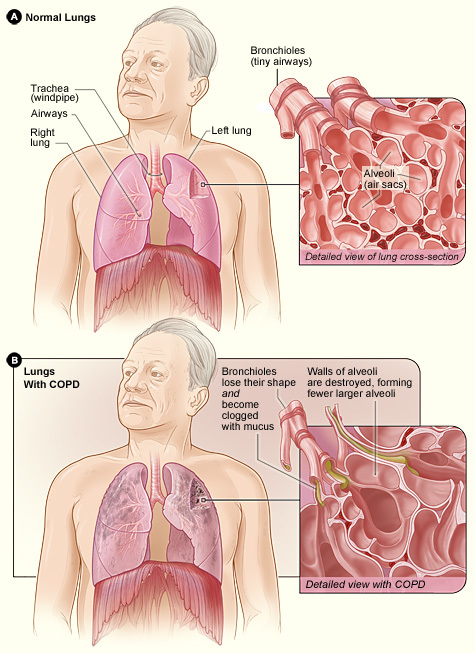 COPD develops over time and will begin to affect your routine activities. In cases with severe COPD people may no longer be able to walk or move around and take care of themselves. Most of those who are diagnosed are middle age and older adults. ← What’s A Good Blood Pressure Monitor?